The so-called Kristin Stewart “cheating scandal” is filled with examples of urban legends. Myths spawned on little more than a baseless point of view by some nameless idiot babbling on the internet, who wouldn’t recognize the difference between a factoid and a fact if their life depended on it. Myths designed to sell a point of view irrespective of how ridiculous and unverifiable it may be. Urban legends that grow and mutate in tweets and blog comments, impervious to the truth. With the success of the original Twilight, Summit Entertainment decided to cash in on the hot on-screen chemistry between its two major stars by forcing them to sign a new employment contract starting with the filming of New Moon. It included a clause forcing them to “fake” a romantic relationship that mirrored the fabled love of Edward and Bella for up to five years in the name of promoting the films. Periodically during the course of those years, in collaboration with and at the direction of Summit, Rob and Kristen “fed” fake romantic encounters to an unsuspecting public to bolster this faked romance. Using the relationship hype to sell movie tickets and dvds. But since they couldn’t very well admit to doing this, they also had to mutually agree to fabricate a breakup at some point after their hyped love affair had finished ringing up those cash registers. After all who wants to live in a fake relationship forever? You have to bring it to a close eventually. But just to make sure that no one welched out on the deal too early, Summit also forced them to collectively agree that neither Rob nor Kristen could end the faked relationship until after the last movie was released and not until after they both agreed. One could legitimately question why Summit would force this final point, the Rob and Kristen’s mutual agreement, but I’ll ask you to hold that thought for a moment. Okay, sounds reasonable enough. It wouldn’t be the first time a movie studio tried to pick the pockets of the movie going audience and mess with the lives of their stars. Until, that is, you actually begin to take a look at whether this notion comports with reality, is based in provable facts, and why it came into being in the first place. So what is wrong with this little piece of fiction. Let’s start at the beginning. The first problem is that signs of a burgeoning off-screen relationship between the two costars was already well under way long before the New Moon contract was inked. They didn’t need a contract to force them into a relationship. It was already happening of its own volition. Rob and Kristen at the original Twilight premier in 2008. Pattinson had already publicly talked of his obsession with Kristen on multiple occasions, admitting that he only auditioned for Twilight in the first place just to get the opportunity to meet her. One look at their Vanity Fair photo shoot session video and scores of interviews, videos, and photos taken of them during the lead up to the release of Twilight punctuates their growing infatuation and comfort level with each other. For two people who have been accused by some of being such poor actors, if they weren’t really interested or “into each other”, they were pretty damn convincing at projecting that notion. The huge success of Twilight caused an almost immediate green lighting of New Moon, which occurred one day after Twilight’s release on November 21, 2008, and it is after that point where Summit purportedly insisted on this mythical PR Relationship Contract Clause. Which is where the second problem comes in. The notion that a studio owns an actor and can unilaterally dictate the terms of their contracts, including dictating their off screen behavior or love life, faked or real, is a notion that is archaic at best, and deceitful at worst. The big studio era when the likes of Louis B. Mayer ruled MGM’s stable of actors with an iron fist died decades ago, to be replaced with what is now a highly regulated, and much more level playing field between producers/employers and actor/employees. If you have any doubts about that, see the 745 Page 2005 SAG/AFTRA Master Agreement that regulates SAG/AFTRA – Movie Producer labor relations at http://www.sagaftra.org/files/sag/2005TheatricalAgreement.pdf. The third problem with this mythical PR Relationship Contract Clause is that even if it existed, it is highly unlikely that it would be enforceable. Contracts clauses can be voided as against public policy not only to protect one of the parties involved, but also because what the contract calls for could pose a harm to society as a whole. For example, a court will never enforce a contract promoting an act that is against state or federal law. Nor will it enforce a contract that works a fraud on the public. This contract would clearly promote such a fraud. That being case, if any such contract clause existed, Rob or Kristen could have walked away from its provisions with impunity at any time. [Editor’s note: 6/6/2013– this nonsense is made all the less likely given that Kristen has been repped by Joel McKuin of McKuin, Frankel, & Whitehead for years. The Hollywood Reporter just recently named him to America’s Top 100 Entertainment Attorneys list and he’s not about to gain that reputation by letting an upstart film studio (Summit) trample all over his client. See http://www.hollywoodreporter.com/lists/joel-mckuin-526351 ]. So if this urban myth was too late out of the gate, unsupportable under the SAG/AFTRA contract, and unenforceable in court, why is it still around and where did it really come from? It came into being because there were some who early in the Rob and Kristen’s relationship, who refused to believe that they were actually an off-screen couple. Coined Nonstens, they fervently argued that it was all fake and all done to hype the movies. And so was launched an increasingly nasty verbal war between them and those who believed that Rob and Kristen were in an actual relationship (coined Robstens). Each side using every off set photo, shared clothing item, interview comment, and other evidence to argue their point of view. It’s hard to remember, but prior to the so-called events of July of 2012, the debate over whether Rob and Kristen were a couple was pretty much over. To most reasonable minds by then, provable evidence established that Rob and Kristen were in fact involved in a long-term, highly private, stable relationship for a matter of years. Most of the diehard Nonstens had thrown in the towel and even shut down their websites. We were well past the Paris tarmac, the Montreal kiss, the WFE premier, multiple visits to each other’s film sets, years of cross continental birthday trips, holidays on the Isle of Wight, shared clothes, knowing looks, and “My boyfriend” is English. Which brings us to the fourth problem with this mythical PR Relationship Contract Clause. If it existed, it would have called upon Rob and Kristen to successfully maintain this illusion for a substantial number of years right in the prime of the dating lives. Which meant they couldn’t openly date or share a romantic involvement with anyone else least it would shatter the illusion. And true to form, despite being one of the most watched, tweeted about, and stalked couples in the history of Hollywood, no credible reports with verifiable evidence ever romantically linked them to anyone other than each other. Not that the tabloids and tweeters didn’t try. They tried to link Rob to Emilie de Raven, Christina Ricci, Sarah Gadon, and virtually every other female costar he had, along with Caitlan Cronenberg, Sara Roemer, numerous random buxom blonds, and a host of unnamed fangirls. Kristen wasn’t immune to it either, as they tried to link her to Garrett Hedlund, Taylor Lautner, and even some girls to boot. And as usual, with unnamed, unidentified sources that were incapable of verification. But the almost uniform reaction to the “scandal” underscores the fact that most people believed that Rob and Kristen were actually in a real romantic relationship. Upon the “scandal” breaking, people did not say “Oh my god, she had a fling with Rupert, I guess she was in a fake a relationship with Rob all along.” No, the reaction was one of shock: “Oh my god, how could she cheat on him.” Which necessarily presumed that Rob and Kristen were in an actual relationship. Rob and Kristen in a rare public display of affection at the Cannes Film Festival premier of Cosmopolis. It wasn’t until people began to grasp for straws to explain why Rob would forgive her so quickly after a very public, monumental humiliation of him, that all of the “PR” relationship theories sprung back to life. And as questions about the so-called cheating scandal photos started to arise. The Nonsten’s argument during this period was that the breakup and reconciliation must be merely a part of a broader public relations plan to sell movie tickets and dvd’s. And so was born this mutated notion of the PR Relationship contract clause that would explain their reconciliation for a period long enough to get the movie released. Like all urban legends this is where the logic gets a little fuzzy. Once again because of that viral mutation thing. For some Nonstens believed that the whole thing was fake from start to finish, while others thought the initial relationship was real but the reconciliation was faked. Which purportedly explained why Rob would actually appear at promotional activities for the film with her despite tabloid claims that he “couldn’t stand to be in the same room with her” and despite claims that ” he refused to talk to her”. But where these Nonstens joined company was in the belief that following the debut, they certainly wouldn’t continue as a couple after that. Would they? In the lead up to the Breaking Dawn 2 premier and in its aftermath, this Nonsten paradigm was quick to crumble. Rather than part after the premier, Rob and Kristen’s appearances together both public and private seemed to only accelerate. So faster than a virus can mutate, so mutated the PR Relationship Contract Clause. Now the Nonstens claimed that the contract required that they stay together in this faked reconciliation until the DVD’s for the movie were released. Despite the fact that Kristen had already arguably violated the clause. Although most of this chatter took place in faceless tweets and blog comments, even some of the tabloids tried to sell this red herring. But as the passing of the dvd release date came and went in February of 2013, Rob and Kristen seemed more together than ever, even with Rob’s temporary trip to Australia to film Rover. Seeing their paradigm crumbling once again, the Nonstens took to twitter and the blogs to claim that the contract actually required them to fake the relationship until August of 2013, unless both Rob and Kristen agreed to break it off. They claimed that at the time of the contract, Summit was unsure of whether the filming would stay on schedule so they “added a few months” to the scheduled dvd release date just to make sure. Rob and Kristen leaving their NYC hotel together during MET Gala week in 2013, prior to leaving for LA. [Not for commercial purposes, no copyright violation intended]. Which leads us to the fifth problem with this PR Relationship Contract Clause. At the time that this contract clause was purported inked late in 2008, the decision to split Breaking Dawn into two parts had not yet even been made. As of that November, everyone was pretty much contemplating a four movie saga. No one at that time could have accurately predicted an end of Saga’s dvd release in February of 2013, let alone that adding a couple months to August would suffice. Which leads us to the sixth and final problem with the PR Relationship Contract Clause nonsense. If the end of Robsten was already fully scripted and scheduled to take place after the final movie and dvd sales release, why was Kristen “captured” making out with Rupert Sanders in broad daylight in a very public place on July 17th of 2012 in the first place? That would certainly throw a major wrench into the illusion that the contract clause was meant to protect. Openly and brazenly behaving in that fashion in contravention to the agreed upon strategy is inexplicable at best and patently unbelievable at worst. But as you already know by now if you have been following my blogs, that event in my opinion is just as unbelievable and not based on any provable facts as the PR Relationship Contract Clause is. More on that point in a later post. In closing, the Nonsten nonsense over the contract clause and the timing of the final breakup of Rob and Kristen is like one of my favorite old time arcade games. You know one, it goes by various names but I kind of like Whack a Gator the best. It’s the one where the gators jump out and your job is to whack them with a rubber mallet before the escape. The urban legend of a PR Relationship Contract Clause end of Rob and Kristen is just like that. Every time the evidence smacks down one version of it, it mutates into something else with yet another date. All based on unnamed, unidentified tweets and comments. and unverifiable tabloid nonsense. 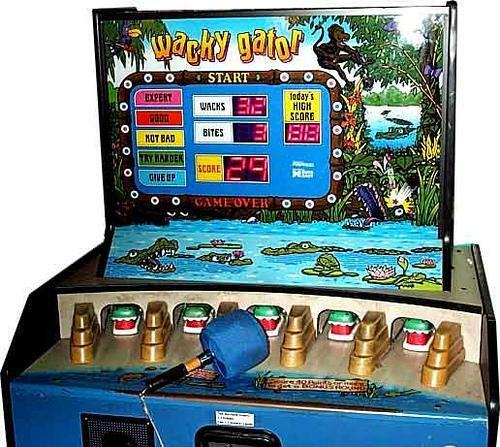 But like many arcade games, whack a gator eventually gets old, just like the PR relationship contract clause itself. Perhaps it simply time to pull the plug on it once and for all and toss it in the garbage where it belongs. And as long as we are talking breakups, see The Top Three Most Patently Absurd Rob and Kristen Breakup Stories of the [First] Forty Eight Hours elsewhere on this blog at http://wp.me/p2JqVX-A5at. Awesome – well researched, well thought out and well written… Great job. So good to see others publicly relegating that stupid “non-existent” contract to the rubbish bin where it belongs. (although it was always there for me. Thank you! Thank you for showing us the legal side of this nonsense! I have never believed their relationship was forced by Summit. I do however think that Summit has tried to control their relationship. This has been obvious at many public Twilight events! I believe Summit created many false stories to manipulate the fans. They are money hungry fools. They couldn’t force them into a contract, but they capitalized on their “real life” romance. I hold Summit responsable for the over invested fans. I believe they created many of the false stories that created the brutal treatment of Kristen. The “created” stories fed the crazy fans. Pitching them to hate Rob or Kristen. We have all seen the damage this has done to both actors. Kristen has received the brunt of this behavior to the point of name calling at best, and death threats at worst. Where was Summit to protect their actors? I’m sure there was much more pressure behind the scene by Summit than we will ever know! Maybe enough to fuel some of the things Rob and Kristen have done this past year? Twilighted, You said something BIG may be happening in front of our eyes. Is that something in the form of a recent picture? That’s all I want to say in case I’m wrong! A picture is involved, actually several, but I am not sure that we are talking about the same thing. The thing that I’m most confused about is, if there was no attention to Rupert (her director) and jt was all a fake story, why did Kristen discuss the momentary indescretion? Or was that a fake also? Pls. advise, so I can understand. Thanks so much, love this site. In short she didn’t. Kristen didn’t discuss anything with anyone, particularly about a momentary indiscretion. People Magazine admits as much, they never talked with her directly. Which is why they to this day refuse to discuss this so-called statement of hers and the circumstances under which it was taken. publicity for sure. In my opinion any young star with any choices at all should think twice before signing up with such an outfit for treatment like that. The actions of them and their now parent studio disgust me. are they still togehter yes or no ? Yes. Just read More Sanity from Misty on here – it’s pretty clear. Thx. I am surprised that you have stated they are still together. I for one believe they are but to be honest. I can’t believe the negativity going on because Rob is now the face of Dior and has been seen with and I am sure he is just friend’s with Katy Perry. I am completely floored that no one has said they are together and they have just got tired of the crap the tabloids have said about them and tell them to leave them alone. It must be a heartbreak for either one of them to wake up and read this nonsense especially if they are or aren’t together who has the right to gossip like this…the fan base of these two young people is unreal especially with all this ugliness and I do think the time has come to start banning people from some of these sites…it is sick. Katie Perry is slandered all over the place his mother Clare is slandered all over the place its insane… I feel these gossip rags should be taken down for all the lies and misinformation they come up with its time for these idiots to start paying the price for lying. So like a broken record are they together or not I will believe you as you seem to have some real sanity about you. No I don’t buy the rags but its amazing how the pop up all over the internet. As per usual, well summed up. I have never believed that summit or any studio for that matter could dictate what actors do “out of hours”. I just think there is more to it all than meets the eye . I try to avoid all the tabloid and webloid rubbish and think of the bigger picture. Then again it just maybe my over active thoughts and Robert and Kristen could be just living their life’s. WHAT have you got against Gators? We Floridians don’t like that! But thanks for the SAG link. I’ve got a few hater trolls that need to be shut down once in awhile. Thanks! I see your comments on Gossip Cop and they are always dismissed with a few extra adjectives for good measure, however, I found your post on the PR contract very well written, well researched and full of common sense- something completely lacking in social media. I know you believe the ‘scandal’ was staged which doesn’t make sense to me, but I have to admit the last few weeks haven’t made alot of sense. I was drawn to this fandom because of the love I saw between Kristen Stewart and Rob Pattinson and it was something I needed to see at a low time in my life- the good fortune and happiness that others have brings hope and a sense of well-being in a world full of hate. The addiction to wanting them to be happy is a no win situation for those not involved in the relationship and it has caused a great deal of misplaced emotions. It has become like waiting for the next installment of a soap opera, unfortunately, this show is not being written by writers who want to make the fans happy. Plus we are given the story as determined by tabloids, and it is not a well written or believable story. Twilighter, you seem to have spent a great deal of time on this story and it is interesting to see your conclusions. I truly vote for happiness and fulfillment for Kristen and Rob and for all those who are fans. I wish it was as easy to write up a story- with the ending we all want, but it is not up to us and these are real people. I can only support their movies and their personal life is not entertainment. We really need to let them go. Twilighter 57__ You may have a long wait. If Diogenese had started his search for one honest man among the present day movie industry he would have lost heart quickly and spent all he owned on lamps to light his way. Amen!! Well said as usual! I’m glad to find people who defend what is just. Now more than ever, h and defends the dignity of this young actress. I have the feeling that someone with economic power, and for the media, is doing everything possible to hurt this girl. You guys are doing a good job. You should be robsten detectives for this. What I wish is that all the celebs, Rob, and Kristen should wear a shirts that should say Papz are stalkers. Or something. The PR contract theory always seemed to ridiculous to me, it scarcely needs debunking, but if people believe it I suppose it’s called for. Good article. Does this count as Part 13? No, 13 is still coming. One more post in front of it. Good. I have waited the longest time for it. Please be as wise as you usually are. We need some good news.